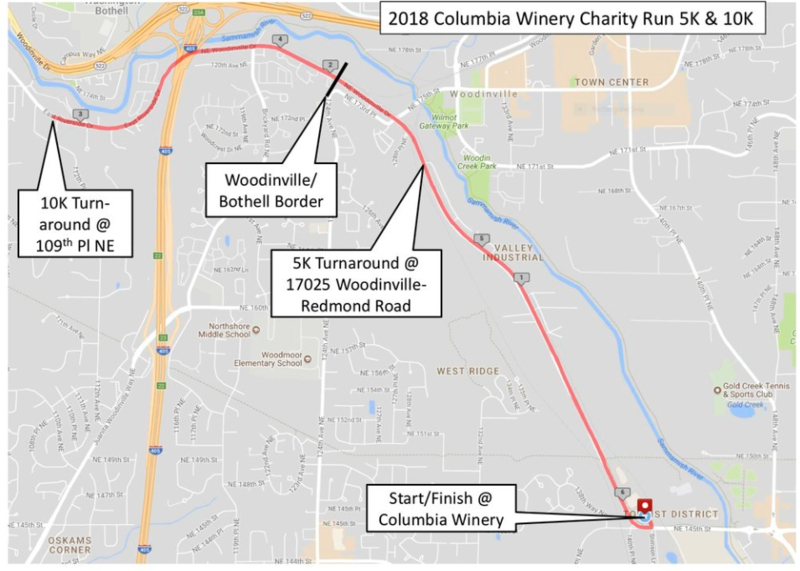 In planning my August race schedule, the Columbia Winery Charity Walk & Run in Woodinville fit nicely. I wanted to do my 219th road run (since 2001) on that particular weekend and I also wanted to run a 10K. This event had a very reasonable fee ($35) and is for a great cause: to benefit Seattle Children’s Hospital (nearly $25,000 was raised). My only concern: The 10K field looked like it might be a bit too swift for me. 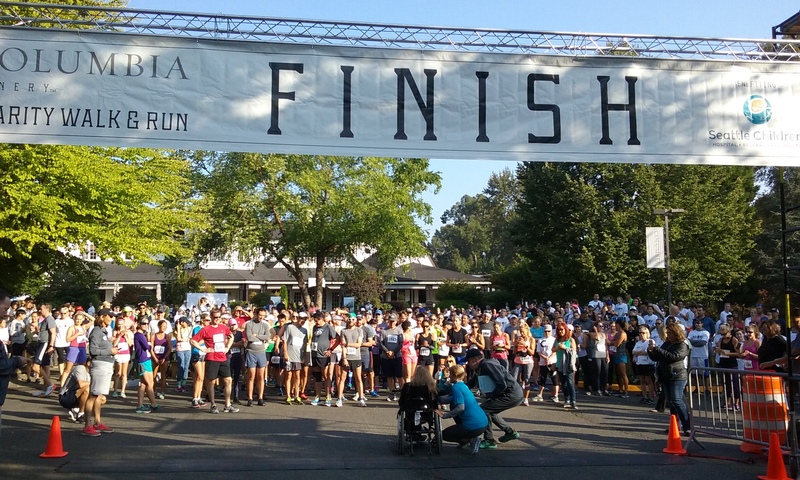 I based this impression on reviewing the event’s 2017 results — which showed my latest times trending toward the bottom — plus the fact that strollers and dogs are not allowed and walkers are discouraged. In other words, with this being my first 10K in 2018 and longest race since my most recent ankle surgery, I was a real threat to finish last. Alas, I signed up anyway. Sure enough, my fears were realized. At the end of the first mile, I was running neck-and-neck with a woman for last place. I thought there might be runners behind us, but when I turned around, I saw a course marshal on a bicycle following us, representing the tail end of the 10K field. That meant that I had to find a way to pass a few people. It made for an interesting race on a warm, dry day in Woodinville’s wine country. Temperatures were in the 80s; fortunately, the Puget Sound-area smoke of recent days (from wildfires up north) didn’t impact the race. Columbia Winery is just across the road from Chateau Ste. Michelle, the region’s best-known winery, and next door to the former Redhook Ale Brewery, which has closed and is now being reconstructed into a Teatro ZinZanni circus and dinner theatre. The course was an out-and-back on N.E. Woodinville Drive, starting and ending at the Columbia Winery headquarters. 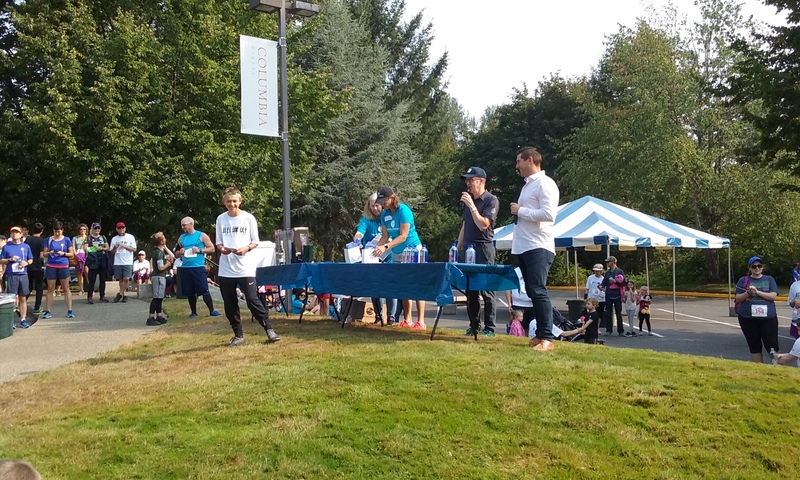 It was not the loop course that was advertised on the website, in which the second half of the run was to take place on the Sammamish River Trail. I realized this change during the run, and I’m not sure why it was made, but I rolled with it. The revised 6.2-mile course took us into Bothell, Woodinville’s next-door neighbor, and we actually ran underneath Interstate 405. Regardless of the course switcheroo, this was a quality event. 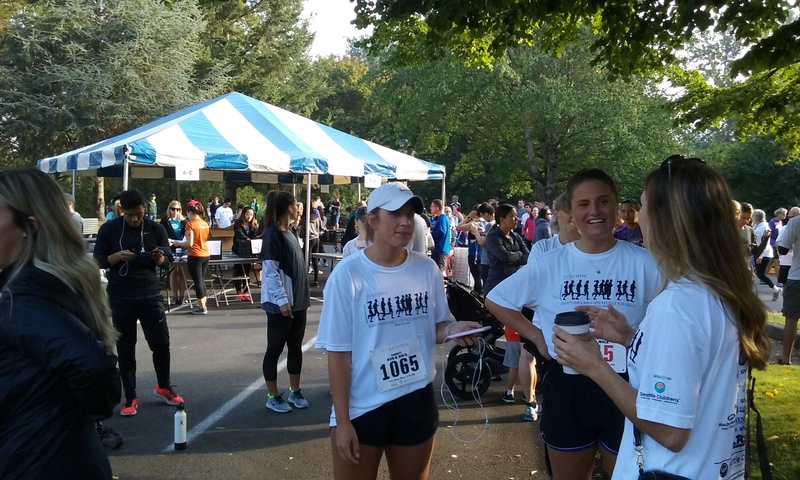 Nearly 800 people did the 5K or 10K. 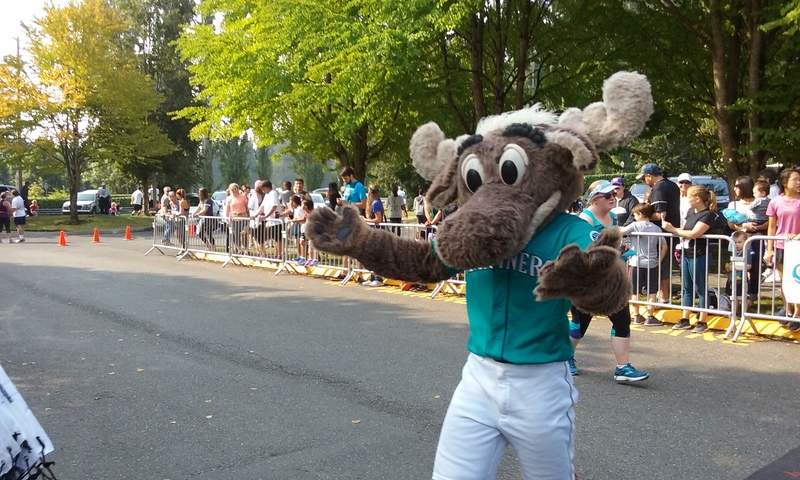 The Mariner Moose was on hand to greet finishers and pose for pictures, and ex-Mariner pitcher-turned-broadcaster Ryan Rowland-Smith handed out awards to the top placers and prizes to raffle winners. Plus, I got another chance to do a race with Hayley Halstead, my Allytics colleague, friend, and frequent running partner. 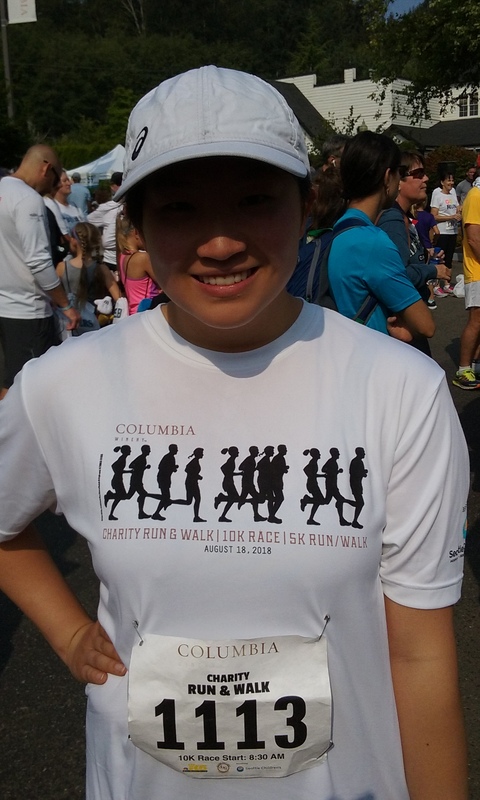 I made a pitch at work to get slow, out-of-shape people to run the 10K with me — people I could beat. Hayley answered the call. However, she is not slow or out-of-shape, and I cannot beat her anymore. Oh well, it was great having her there. She passed me within the first mile, ran a great race, and patiently waited for me at the finish line — even took some pictures of me as I tried to put on a finishing kick. Thanks, Hayley! Back to the race. So, in the second mile, the woman I was running neck-and-neck with moved ahead of me and I never saw her again. But I caught up with and passed another woman, who passed me back, and then I passed her again. As we headed into the third mile, I also ran past a young man walking along the course as he checked his phone. Indeed, he had a race bib on, and was simply pooped. I also caught up with a man and woman both doing the run-walk thing. They began using me as their rabbit — I’d run a steady pace and catch up with them, and then they’d dash off and get way ahead. And then start walking. It was rinse and repeat through the halfway point turnaround in Bothell. I remained ahead of them and the two others. I am frequently the rabbit for run-walkers, but I like my odds with them. They tire out fast doing that strategy. As I built a lead on two of the runners, and passed another woman in mile 5, I had the two run-walkers to deal with the rest of the way. But … they noticeably started walking more and running less. And their runs eventually became a way just to catch up with me, not move ahead. I beat them both to the finish line by 26 seconds. All told, I finished 232nd out of 237 runners, with a time of 1:22:32 (13:17 per mile). That was four minutes ahead of the last-place finisher. I will have to accept it; the 1:22 is the same time as my last 10K, in February 2017. My 10K PR is 51:44 in 2005, so I’m a half-hour slower than I used to be. Still, I enjoyed the run and the competition. Full results are here. Congrats to Hayley on her time of 1:12:36. She will be under an hour in probably her next 10K. 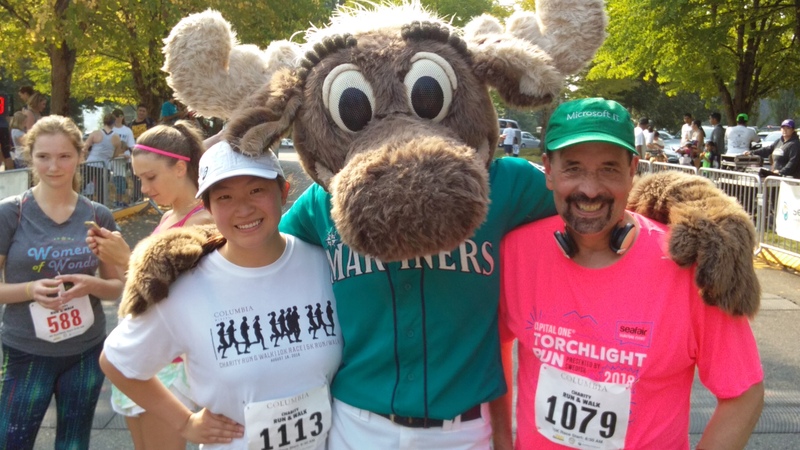 The Overlake Labor Day Half Marathon and 4-Mile Run is September 3, and I am likely to opt for the 4-miler (unless my daughter’s plans to visit home Labor Day Weekend make this run expendable). If I don’t do this run, there are several others to do in September and October. I need to get some more long runs in before I tackle a half-marathon, as I learned from this run. The Seattle Half-Marathon Walk in November sounds better right now. I can run and walk that event with others who are doing the same thing. Thanks for reading! Let’s hope this awful smoke blows away soon for good. 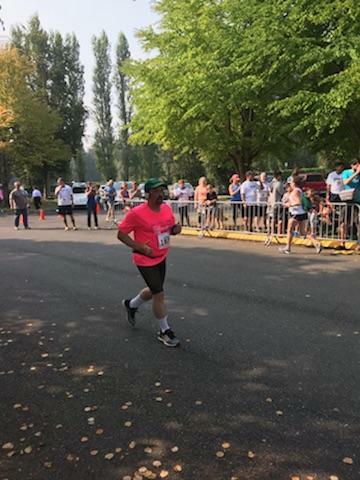 This entry was posted in 10K, 5K, ankle surgery, Running, Sammamish River Trail, Seattle Marathon and tagged 5K, Allytics, ankle surgery, Bicycling, Columbia Winery, Half-Marathons, Hayley Halstead, Running, Sammamish River Trail, Seattle Marathon, Walking. Bookmark the permalink.